Birds At Home (Stokes): Meet Donald & Lillian Stokes, and check out their new programs. North American Bluebird Society: A great site to help you get started. Cornell Nestbox Network: Find out how you can participate in their studies. Benefits include unlimited resources from experts. Gilbertson PVC Nest Box Plans: A different design, plus plans for a sparrow trap. Bluebirds & Birdwatching: Check out Rosebud's beautiful bluebird page! Peterson's Perspective : A tutorial for bird identification,birding & birds. Native America: More bluebird & tree swallow info, a unique nestbox design for woodpeckers and some interesting information about Long Island, NY. Peterson Bluebird House: Detailed plans for Peterson nesting box, courtesy of Norther Prairie Wildlife Research Center. Prescott Western Bluebird Recovery Project: A good web site dealing with WESTERN bluebirds. MORE BLUEBIRD LINKS: You will find more places to visit on my links page. Most of the information found on the following pages is based on my own experiences attracting bluebirds here in Massachussetts, which will pertain to the Eastern Bluebird. There are some differences, especially for nest box dimensions, for people residing in western U.S./Canada who wish to attract Western or Mountain Bluebirds. My appologies, as sometimes I forget how far reaching the web is and plan to add additional information for these western species in the near future. Whether you're just starting out or have had previous experience with bluebirds, please contact me with any feedback or ideas which will help develop this page into a useful tool. Bluebirds are cavity nesters, using old woodpecker nesting sites in hollow trees or holes in or on fence posts. Because they lack the ability to chisel out one of their own, man-made nest boxes can be substituted to compensate for the short supply of these natural cavities. What kind of nesting box should I use? With a multitude of designs on the market, this may seem like a difficult question, so we will try to narrow down the choices. Bluebirds seem to prefer a cavity with an inside dimension of 4 to 5 inches with an adequate depth (floor to entrance hole) of 7 to 8 inches, so this will eliminate large and/or short boxes. Although not a preference for the bird, a 1 1/2" entrance hole will cut down competition from other birds such as starlings. Also look for a design that easily opens to simplify monitoring and cleaning. A good nesting box will be made out of 3/4" or thicker wood for proper insulation from the heat as well as the cold. I shudder every time I see someone selling birdhouses made out of 1/4" plywood or tin roofs! Not finding anything I liked initially, I combined and modified ideas from several designs over the years. Go to Eastern Bluebird House Plans to view my design with cutting and assembly instructions, if you'd like to build your own. 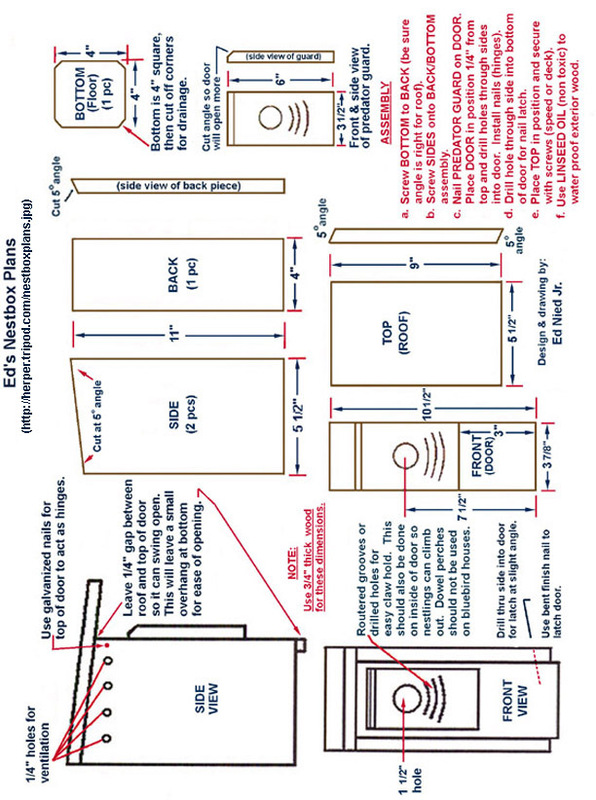 NOTE (2/25/2001): I have updated the nestbox plans. Basically, it is the same except the front and back have been swapped which will now make the roof slope down towards the front. This change, along with a slightly longer roof will be more likely to keep wind driven rains from entering the entrance hole. The drawing will take a minute to load and will appear sideways. This wasn't meant to give anyone a stiff neck, but should give you a legible copy by simply hitting the print icon on your browser without having to format for landscape paper position.